In this brand-new piece by Danielle, written for New World Library Unshelved, she dives into the nature of the summer solstice — which in the northern hemisphere arrives on Thursday, June 21, 2018, at 3:07 a.m. PDT — encouraging us to create our own rituals and celebrations to honor this big change in the seasons. If we take our lessons from nature, the summer season is a time of intensity, fruition, celebration, and blooming. Beneath the silver moon on these warmer nights, we are tasked to forgo our more somber rituals in the name of sensory experiences and hedonistic delights. We, as primal creatures, are asked to pause at summer solstice and claim our ancestral inheritance. Our blood remembers the joy and the jubilance, the communal dance, and the sheer revelry our ancient foremothers honored as the Wheel of the Year turned to its brightest peak, and our cyclical nature beckons us, year after year, to come home to this wild and joyful knowing. How do we attune to the merit of our joy in an age of such political volatility, social chaos, and collective transformation? We begin by asking ourselves to take stock of those moments in our lives when we truly felt joyful. Sifting through our epic personal myths of woundings and healings, misfortunes and miracles, we can make note of those pivotal and fleeting moments when we were swimming in a wellspring of sheer elation, when our joy was coupled with gratitude and our in-the-skin experience soared so high above mere happiness we wondered what we had done to deserve such grace. Become a joy-hunter on these longer days by considering each stage in your life as an integral chapter in your story. From early childhood until this very moment, how many chapters have you lived? These chapters need not necessarily be linear; nor they do they need to correspond neatly to the formal life-stage names from Western psychology. A nourishing weeklong vacation when the lens through which you saw your world irrevocably expanded might be an entire chapter despite its limited duration, while a decade spent in a soul-starving relationship may only be a single chapter. This is your story to tell, and its order and organization are entirely up to you. Within each of these chapters, dig through your memories in search of the joy. This practice may take some time and devotion. Even within the apparently mundane or painful chapters that have inevitably been part of your lived experience, joy-mine your memories to uncover the precious jewels you were gifted. These are ephemeral moments, temporary cosmic nods when your heart affirmed, Yes. Yes, I am really here in this body. Try to harvest at least ten joyful moments if you can, then search for the notable patterns in those experiences. In the absence of such intentional inventories as these, we tend to assume that the ways we experience joy are the same ways that others experience their joy. Know that your patterns are unique to you, and they may well surprise you. Were you often outside in nature in these moments? Do your joyful moments reflect solitude or community? Movement or stillness? Find the patterns that exist among your most joyful moments, and pay particular attention to those that occurred during summer. Both the summer and winter solstices are points of pause, holy days on which it serves us well to stop and reflect. A ritual can be a container for such reflection, a simple ceremony that honors the nature of the season and offers up precisely the nourishment that the soul needs to connect with the spiral dance of time. Trusting your own experience and the patterns evident in your unique memories, set the intention to create a ritual of joy reclaimed and jubilance remembered. Consider each of your joyful patterns to be a brilliant-colored thread, and weave together an artful tapestry through your ritual. Incorporate all your joyful themes if possible. If you were often dancing, dance. If you were often alone in nature, carve out space for sacred solitude and wander into the wilds. If you always experienced joy with another person who is no longer with you or for whom your love has waned, consider writing them a letter describing the gratitude you feel for those joyful moments you spent together, though they need never read it. Similarly, if a particular place you no longer visit brought you joy, perhaps honor this place by building a small altar reflecting its elements. Let nothing keep you from your joy this summer solstice. Do what you need to do to feel elation and delight, if only for a few precious moments. Joy is, after all, fleeting by nature. What if the flowers themselves bloom bright despite a deep knowing that their beauty is temporary? Why bother? doesn’t exist in nature. No fear is so great that it blocks the flora or fauna from fulfilling their purposes, and humans do well on these longest days to remember our right to feel an ecstatic connection with the beauty of the wilds, the beauty that is our epic journey of magick made and joy reclaimed. 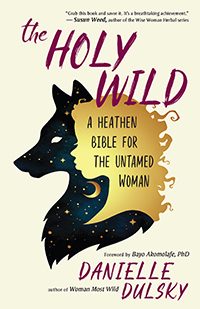 Danielle Dulsky is the author of The Holy Wild and Woman Most Wild. She is an artist, yoga teacher, energy worker, and founder of Living Mandala Yoga teacher training programs. She leads women’s circles, Witchcraft workshops, and energy healing trainings and lives in Phoenixville, Pennsylvania. Find out more about her work at LivingMandalaYoga.com. Based on the book The Holy Wild. Copyright © 2018 by Danielle Dulsky.